I've mentioned in previous posts that one of my main goals is to minimize use of private one-to-one emails in my classes, using other modes of communication instead. One of the most important is my daily Class Announcements, which will be the subject of this blog post. Details: The best way to get a sense at how the Announcements work is to take a look at the Announcements blog for yourself: Online Course Announcements. Indeed, one of the reasons why I like blogging software for this purpose is that it has the announcements out in the open, for anyone to see. I write the announcements during the day, using Blogger to queue them for publication at midnight, Oklahoma time (when I am usually already in bed asleep). I am able to do one set of announcements for both classes because the basic assignment structure is the same in both classes, and the content overlap is very strong. All the enrichment material I share with the Myth-Folklore class is potentially of interest to students in Indian Epics, and vice versa. In the body of each post, you will see an opening paragraph which states the day and week. This is important because people might be working on their own schedules and not remember what week of class it might be. I include information there about due dates, grace periods, etc. for that day in particular. If/when there is some kind of computer outage or other breaking news item, I also include that up at the very top, updating as needed through the day. Since the most common type of outage is an email outage or a D2L outage, it sure makes sense to include that information here, rather than trying to communication that information by email or with D2L announcements, eh? In the Class Procedures and Reminders, I always have a link to the Storybook Stack (more about the stack here). As the semester progresses, more and more of the material in this section is something I am reposting from earlier in the semester. 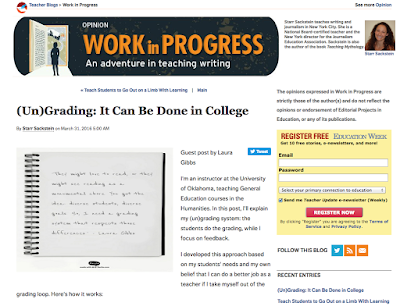 I keep an eye on the students' blogs, I see how their projects are going, I get the occasional email query — all of that information allows me to gauge what people might be uncertain or confused about, and I address those issues in the announcements. Miscelleanous. I start off with a miscellaneous item — usually something funny or inspirational or both. Often it is an item related to writing, but it really could be anything to do with school, stories, books, art, etc. Words. I include either an English spelling item or there is an English word origin — either an English word from India (since I teach Indian Epics) or an English word from mythology (since I teach Mythology). Featured Storybook. This is a Storybook from a previous semester (either class) which might be useful to students for content, style, design, etc. Free Kindle eBook. I am such a fan of free Kindle eBooks because they are so convenient to read on any kind of device: Kindle, mobile, or desktop via the browser. The books usually parallel the reading schedule in Myth-Folklore, but I make sure to include one or two India-related books each week. Words of Wisdom. These are proverb posters; I make sure to have one or two proverbs each week from India. Indian Epics image. I include an art item each day from the Ramayana (Weeks 1-8) or from the Mahabharata (Weeks 9-15). I am glad the students in Myth-Folklore get an introduction to Indian art in this way. Event on Campus. I can almost always find at least one event on campus to include. Best of all is when students want me to announce an event they are involved in personally. On-This-Day. For the last item, I include an "on this day" item of some kind. It might be a holiday announcement, a birthday, the anniversary of someone's death or of some important cultural event. Occasionally, when the campus event is a really important one and/or when I have a really excellent graphic for the campus event, I will omit this time to keep the focus on the campus event as the final item in the post. In addition to the main post, there is also the blog sidebar space, but I don't have a lot in the sidebar of the blog as I don't want it to get too cluttered. I have links to the most recent announcements (helpful for students who check in only periodically but who want to get caught up on the announcements). There's also a "semester progress" widget which shows how close we are to the end of the semester. 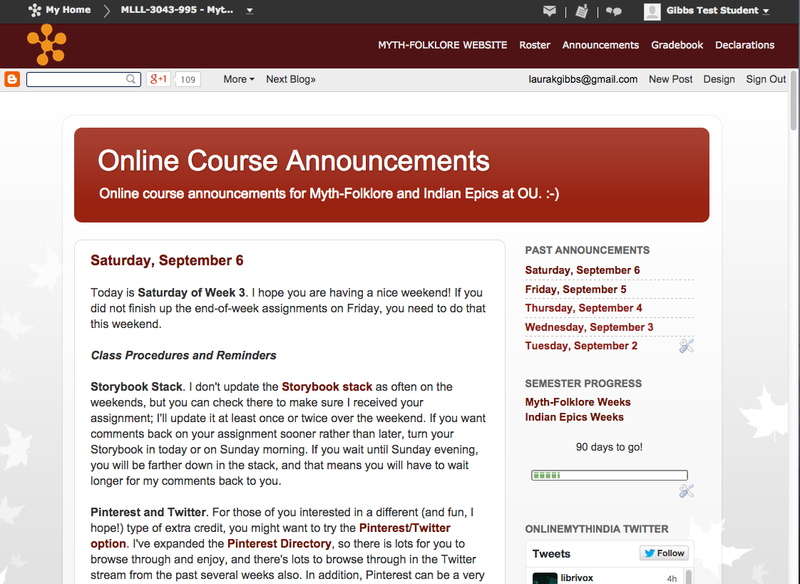 Below that is the class Twitter widget (I'll say more about the class Twitter feed in a separate post). There's also the anonymous "suggestion box" (also a topic for a separate post), and a form for students to sign up to receive the announcements by email. History: I used to do announcements Monday-Friday only, but since so many of the students do their course work on weekends (and some of them do work for this class only on weekends), it made sense to switch to every day including Saturday and Sunday. Since it just takes me a few minutes to put together each day's announcements, that's not really a burden at all. I've been through various blogging platforms over the years, but in the summer of 2007 my b2evo installation got hacked, so I started shifting everything to Blogger and using it pretty much exclusively for all my blogging, both personal and school-related. I've had this Blogger blog of class announcements going since August 2008. I've been evolving the different content sections over the years. I always had the "On This Day" item, while the other content areas are more recent additions. Share Up-to-Date Information. I want students to have instant, up-to-date information about the class, including breaking news about computer outages, campus closings, etc. Promote General Education. The continuous stream of books and artwork is intended to provide both curiosity and passion for the cultures of the world. Promote Campus Events. I want to promote awareness of campus events, especially any events in which the students themselves are involved. Instructor Presence. I want to create a strong sense of presence, showing my daily commitment this class, as well as giving the students a sense of whom I am as a person and what things are of interest to me. Reduce Email. The announcements are intended to reduce email, both for students and for me. I love writing the announcements! It's not really a blog in the traditional sense, but it offers much of the same satisfaction that blogging does. It is surely no accident that I use the same content management strategy in the Class Announcements blog as I do in my long-running Bestiaria Latina blog. In fact, I evolved this content re-use strategy for the Bestiaria first, and then I realized that it would work perfectly for the Class Announcements also. The fact that I love writing the announcements is a sign that makes me hopeful the announcements can be fun for the students too. They sometimes mention the announcements in their end-of-course evaluations, and I am especially happy when students remark that they want to go back and read some of the free ebooks once the semester is over and they have time to read. By way of contrast, a friend of mine who teaches online tried doing daily announcements, but she did not like it at all — it just did not fit her style of interacting with the class. And that makes sense: it's a very personal thing. That's why I would never label any of the things I do as "best practices." I can only attest that my course design strategies work for me, and I am very aware of just how idiosyncratic these strategies might be. I've always been the kind of person who embraces a daily routine, so the idea of daily announcements works great for me. I feel so lucky that the advent of the Internet makes this so easy to do! In terms of the future evolution of the announcements, Twitter is clearly going to help me push things to a new level. I'm still experimenting with how that will work, but the Twitter widget has already proved to be a great addition to the Announcements blog itself, and I've also been resharing items from the Announcements via the Twitter feed. I'll have more to say about all that when I write up some posts on the fun new Twitter experiment for Fall 2014!